It is often said that childhood means simplicity – joy, laughter and carefreeness. These are elements that we often look back upon and smile at as we grow up to take on the complexities of adulthood. 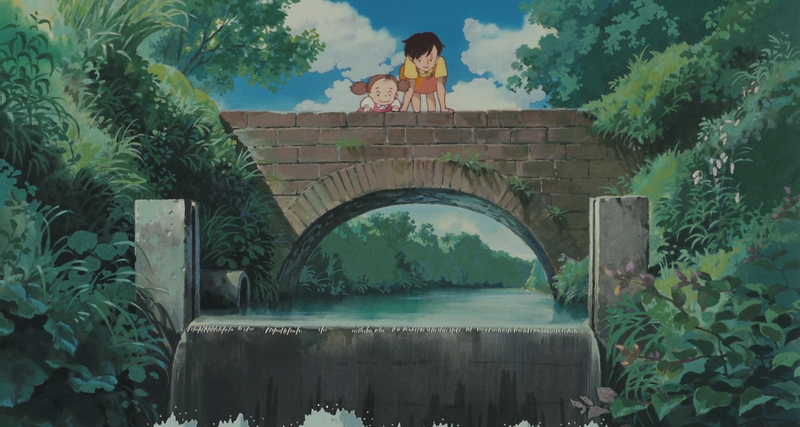 No matter who we are, this sentiment showcasing the radiance of childhood is shared by everyone and what better way to travel back into the joys and wonders of our innocent past while leaving the hassle and pain of growing up is through another of Miyazaki’s fantastical creations – his 1988 masterpiece “My Neighbor Totoro”. Truth be told, when I first stumbled upon Totoro, my first impression was that it was just another animation, with a cliche happy ending created solely to entertain children. My guess could not have been any more far off. Totoro is far from your run-of-the-mill animated movie or cartoon, crafted with remarkable animation skills that will not only leave the viewer in awe but also agog with sheer excitement and suspense of what’s to come. At first glance, the movie weaves a intricate and prepossessing tale fabricated from a child’s imagination and to some extent, this is true. The film stars two girls, Satsuki and her sister Mei who, together with their father, move to a new house in a provincial part of Japan after their mother fell ill. Soon after they move in, Mei sees a mini Totoro scuttling away from her. After several futile attempts to “catch” Totoro, Mei tells her dad about it. Instead of chiding her for making up fictitious characters, her father plays along and tells her that Totoro will reveal himself when time is right. Also, a neighbour’s grandmother tells Mei and Satsuki that Totoro can only be seen by children. From then onwards, the girls not only learn of the animal spirits living in the nearby forest but they also meet one of the most gargantuan and cuddliest spirits of them all – the eponymous Totoro. Totoro then befriends them and through his friendship, viewers get to enjoy watching the girls live out their childhood, everything from heartwarming sisterly moments through squabbles to tough predicaments. Some of these moments are extremely relatable which makes the film a trip along memory lane that will serve to bring up some of your most cheerful and also heart-wrenching moments. Talk about tugging at one’s heartstrings! Just to provide some insight on the film – you can expect to see everything from magical plant seeds that sprout by performing a dance ceremony with Totoro, to even a cat-bus hybrid that responds to Totoro’s calling. Oh, if only things work that way in our world! Beyond this wonderfully crafted plot and storyline, another thing that will leave you amazed is the animation of the film. The animation is so intricately detailed that apart from making characters come to life, everything else from their expressions to how they look are uniquely representative to each of their individual personalities. This distinct and elaborate animation style is a trademark of Miyazaki and is what sets him apart from his fellow animators time and time again. Not to mention that it makes the audience feel a sense of closeness with the film’s characters. Totoro is one of my most re-watched movies and also one of the top grossing films of Studio Ghilbi. This movie crafted by the capable Miyazaki will once again capture your attention while leaving you simply astounded by the greatness of the film. So, sit back and relax as Totoro brings you on a wanderlust-fuelled journey to re-live some of the greatest childhood joys we had as well as the ones we wish we could had. – My Neighbour Totoro is inspired by the story of Alice in Wonderland. -During the film’s initial release, it flopped at the box office. -In the original drafts, Mei and Satsuki were one person but Miyazaki later realised that a four-year-old wouldn’t realistically be independent enough for the plot to work. -Real life siblings Dakota and Elle Fanning voice Satsuki and Mei in the Disney dubs. -Totoro is still the mascot of Studio Ghibli ever since the release of the film. -A Totoro toy appears in Disney-Pixar’s Toy Story 3.